Credit where credit’s due: The New York Mets are very good this year, and they wholeheartedly earned the NL East title. But given the team’s habit of historic late-season collapses—recall, for example, when they blew a sturdy seven-game September division lead in 2007 by losing 12 of their last 17 games—there must’ve been something else at play, some lucky stroke or ethereal presence, for the boys to clinch the playoffs so cleanly in 2015. Is Mrs. Met wearing a new amulet, perhaps? Are there real angels in the outfield? Could it be the spirited endurance of injured captain David Wright or the pious tears of shortstop Wilmer Flores? Or is it something else altogether, like a rare Citi Field pilgrimage from Yo La Tengo, a band of lifelong Mets fans so devout they more or less named themselves after the team? 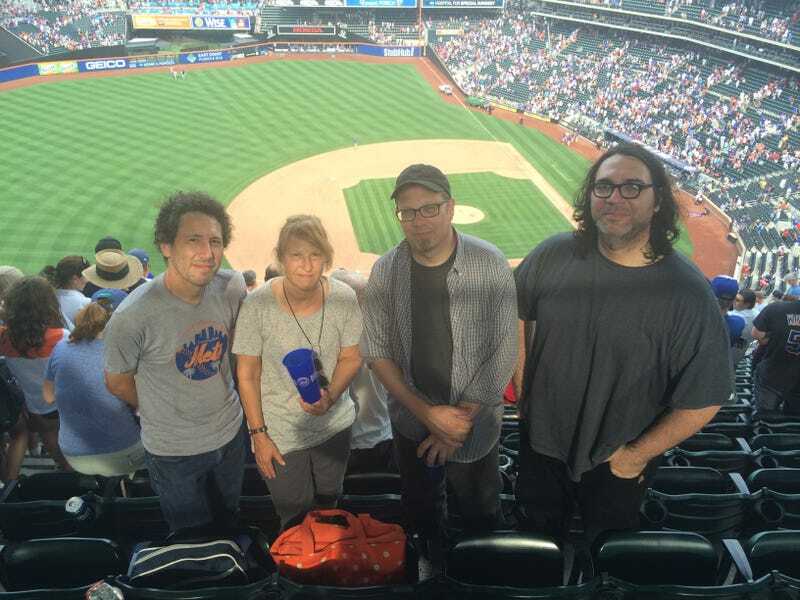 Yo La Tengo are all lifelong Mets fans, but all four members cast their relationship differently. Hubley—the Upper West Side daughter of two Oscar-winning, jazz-loving animators—was introduced to the Mets by her babysitting older brother. To her, the allegiance seems intrinsic, like a shoe size. Schramm, meanwhile, talks about the Mets like an adopted uncle. His father was a Brooklyn Dodgers diehard, until the team went west. “He never forgave them,” said Schramm, shaking his head. The Mets were all he had left. So 15 years later, when it came time to christen the Hoboken, N.J., band he’d formed with his future wife, they favored baseball terms for band names. The Bad Hops stuck for a bit, and also A Worrying Thing, a phrase used in Lawrence Ritter’s classic The Glory of Their Times. Eventually, though, they settled on Yo La Tengo, which would have them billed early on as “Wo La Tengo” and later introduced by Conan O’Brien as “Yo Lo Tengo.” The reference comes from an alleged blunder from Mets left fielder Frank Thomas that passed into team lore thanks to Roger Angell’s Five Seasons—an anecdote that Kaplan is so tired of retelling, he enlisted former first basemen Ed Kranepool to do it instead in a video explainer. In other words, some Mets fans speak in tongues, while others pray silently in their own private pews, and Yo La Tengo are firmly in the latter camp. On this afternoon, they didn’t participate in The Wave. They didn’t chant, “Let’s go Mets!” or sing along to “Take Me Out to the Ballgame” during the seventh-inning stretch. Hubley occasionally plugged her ears when the music got too loud. The loudest display of frustration took place when Red Sox center fielder Mookie Betts hit a bloop triple, tying the game at 4-4, and McNew muttered, “Crap!” despondently. Kaplan looked genuinely betrayed, like a stranger had just taken a bite of his sandwich. Camille Dodero is a senior editor at Billboard Magazine. Go Sox.